Cystic fibrosis (CF) is an autosomal recessive disorder that is caused by a deficiency/mutation in the Cystic fibrosis transmembrane conductance regulator (CFTR) gene. It is characterized by the loss of chloride moment that manifests in multisystem disease. It affects the upper and lower airway, lungs, exocrine pancreas, small and large intestines, hepatobiliary system, salivary and sweat glands, and vas deferens. Pulmonary exam: crackles and/or wheezing can be heard on the exam. CF diagnosed by ≥ 1 characteristic clinical feature of CF, history of CF in sibling, or positive newborn screen PLUS laboratory evidence of abnormality in CF transmembrane conductance regulator (CFTR) gene or protein. *It is important to keep in mind that while sweat chloride levels are a common way to diagnose CF, a considerable number of patients might not have abnormal values. **Another important point regarding genetic testing is that there are MANY genetic causes of the disease and certain screening exams only look at the most common mutations. If a patient is negative on an initial screening but the suspicion of CF is still high either a more in depth screening or full sequencing of the CFTR may be indicated. N-Acetylcysteine: this is a medication that loosens mucus plugs by cleaving disulfide bonds within mucus glycoproteins. Dornase alfa (Pulmozyme): recombinant human DNase (rhDNase) therapy associated with improvement in lung function (thought to clear leukocytic debris). Inhaled hypertonic saline: this treatment lacks direct evidence however it might provide benefit to patients. Ivacaftor: used for patients with at least one G551D mutation. This mutation causes inproper opening of the CFTR channel protein, and Ivacaftor binds the CFTR and acts as a channel “potentiator” (essentially it allows the channel to open and operate properly). Antibiotics/Antifungals: while the underlying condition of CF can not be treated with this therapy, the frequent pulmonary infections that are common should be treated with pathogen specific antibiotics. Common causes of pulmonary infection are: Pseudomonas aeruginosa, S. aureus, S pneumoniae, and Aspergillus fumigatus. While the genetic cause of CF is not preventable, newborn screening for CF is implemented in all of the U.S. (however some less common mutations will not be picked up on screens). Pancreatic insufficiency: certain individuals with CF are at risk for developing pancreatic insufficiency, and these patients should be given supplemental fat soluble vitamins (because the lack of proper pancreatic function will cause deficiency in fat soluble vitamins). Bronchiectasis: CF is the most common cause of this respiratory loss of elastic tissues. Meconium ileus: In cystic fibrosis, meconium plug obstructs intestine, preventing stool passage at birth. Male infertility: male patients with CF are almost always infertile because of improper development of the vas deferens. 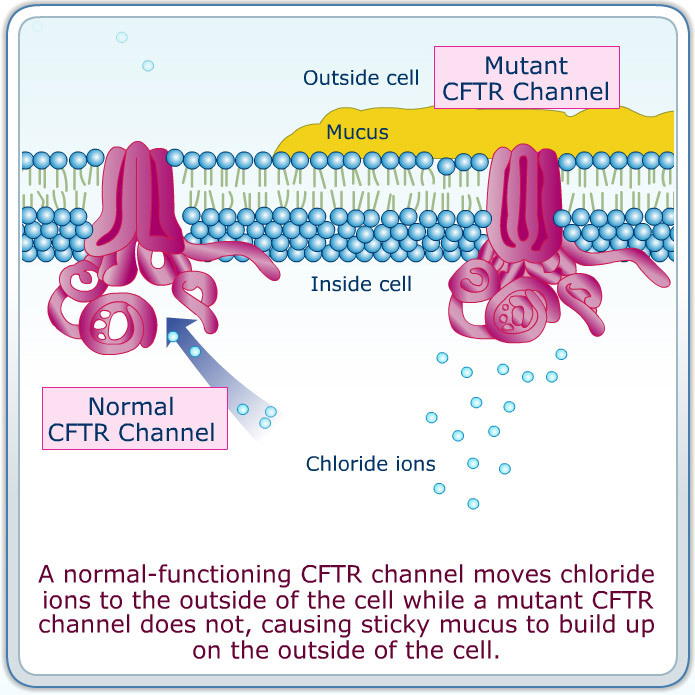 ΔF508 mutation is the most common cause of CF: a 3-nucleotide deletion on chromosome 7 coding for a phenylalanine residue The mutation affects the CFTR channels by causing them to be prematurely degraded in the cell’s Golgi apparatus.